With the USA Women’s national team winning the first Volleyball Nations League championship last weekend in Nanjing, China. 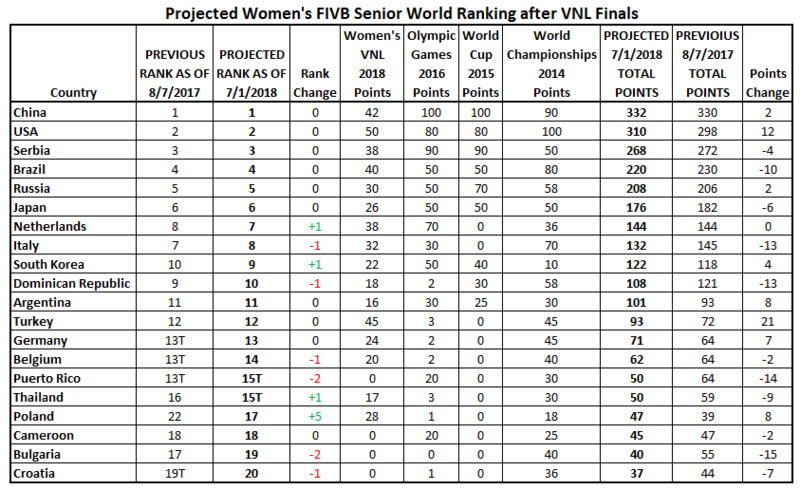 The FIVB should be releasing their updated FIVB Women’s Senior World Rankings shortly. As the FIVB has not announced the new ranking points awarded for the Volleyball Nations League, Volleymob has decided to use the points rewarded for the 2017 World Grand Prix for positions 1-16. As the USA finished first they would receive 50 points, while Argentina who finished in 16th would receive 16 points. Again these points maybe correct or approximate, so the official rankings could change slightly. Volleymob is expecting that the FIVB will only have four events count for the FIVB Rankings, the just completed VNL, the 2016 Olympic Games, the 2015 World Cup (Brazil receiving points for 2011 as they were the hosts for the Olympics and could not play in the 2015 World Cup) and the 2014 World Championships. 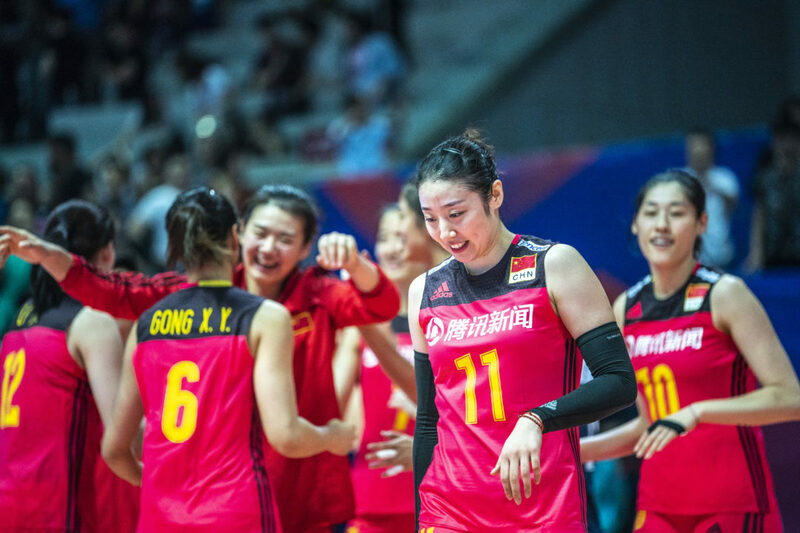 When the FIVB Women’s Senior World Rankings were last released on August 7th, 2017 after the conclusion of the World Grand Prix Finals, China was ranked 1st with 330 points. China’s wins in the 2015 World Cup and the 2016 Olympics and a 2nd place at the 2014 World Championships gave them a significant advantage over the United States, who were in second with 298 points. Below is the projected ranking table for the top 20 teams. China with their third place performance maintains the top position in the FIVB rankings. Even if the points given for the VNL are slightly different, China still has a significant point advantage over the United States who remain in 2nd place. The United States with their win have narrowed the point gap by a projected 10 points with their victory in the VNL Finals. Serbia, Brazil, Russia and Japan all maintain their positions from 3rd to 6th. With the Netherlands making the Finals, while Italy did not, the Netherlands was able to leap frog over Italy into 7th place. With the South Koreans performing better than the Dominican Republic in the VNL, the South Koreans have moved into 9th place. The projected biggest position mover is Poland, moving up five positions from 22nd to 17th with their 9th place finish in the VNL. While Turkey is expected to be the biggest points mover with 21 more than the August 2017 ranking due to their loss in the Final to the United States. « #VNL Final Six Scenarios for July 5, 2018: Who Can Clinch?